Success, managed to finish my 1st few mycenaeans today, really just the bases needed to be done. So that's the 1st 10 done, only another 80 or so to paint... Now I've managed to get some fully painted and based it seems that the 1/72 miniatures look fine based up for WAB. So I'll be cracking on with them over the weekend to try and add another 10 including command to the unit. Still awaiting my WAB book, which I ordered earlier this week, today's damn postal strike has delayed my book for another day. Fingers crossed it'll arrive in the morning. 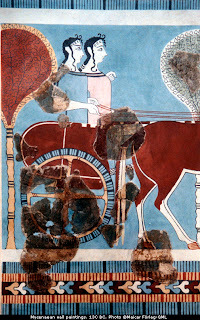 Unfortunately from the little I know about Mycenaean Chariots the horses should not be decorated to this level, the shape is roughly right for the type of chariots used at the time. 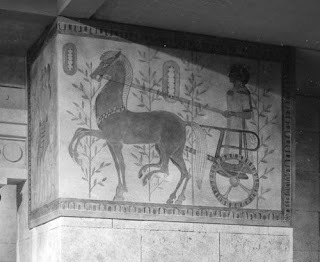 Off to investigate some more options for chariot/horse choices. 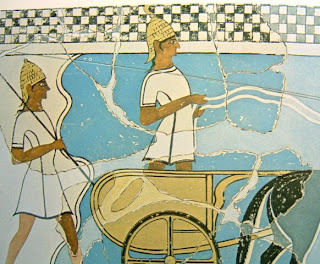 Some reference material below, I can live with not getting a chariot with 4 spokes as in the mycenaean art work.